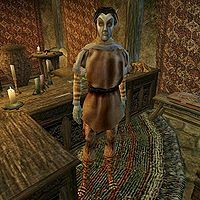 Goldyn Belaram is a Dunmer pawnbroker who runs a pawn shop in Suran, where he buys and sells a wide variety of goods. He wears a common shirt, pants, and shoes. Aside from his natural resistance to fire and the sanctuary provided by his ancestors, he knows no spells. This page was last modified on 11 April 2015, at 03:43.